Following a novel of magic and ancient Egypt (The Alchemist, 2001) and a romantic werewolf series (The Passion, 1998; etc. 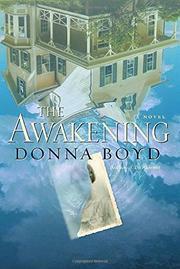 ), Boyd offers an intriguing, though never actually scary, ghost story (with echoes of the movie The Others). Mary wakes without memory in a undefined place, then returns to her home, where she catches momentary glimpses of Paul and Elsie Mason, whom she believes to be her family. Her circumstances and formal diction tell us she’s a ghost long before she figures it out. Paul, a once successful author with writer’s block, and Elsie, his unhappy, isolated,13-year-old daughter, are spending the summer at the lake-house outside Chapel Hill; his wife, Penny, a busy surgeon, joins them when she can, which isn’t often. Paul’s brief, thoughtless, affair with a student cost him his teaching job, and Penny’s near-total absorption in her work has their marriage hanging by a thread and has put their daughter in therapy. Elsie and Paul, separately, encounter Mary; Penny, when she visits, has disturbing, blood-soaked dreams of murder. Because they’re so alienated from one another, their experiences remain secrets, driving the family further apart, until Paul and Elsie finally speak up and form a new bond, discussing and researching their ghost. Cathy, Paul’s sister and Penny’s best friend, coping with her husband’s terminal cancer, has thrown herself into researching her family history; Cathy’s loss, meanwhile, makes Penny rediscover her love for Paul, and her research reveals that a Mason ancestor murdered Mary’s family. In a satisfyingly plotted climax, the Masons and Mary come together to restore the ghost’s memory, allowing her to move on in the afterlife, thus saving both the marriage and Elsie’s life—for Elsie, we find out, has suppressed the memory of her best friend’s suicide and is headed that way, too—good deeds that were the purpose of the visitation. A clever, engaging diversion with just enough substance to chew on.